Karen Hugg, owner of Red Madrona Gardens, a garden design and maintenance company, eats, breathes and blogs gardening. For those of you avid green thumbs immersed in the online world of gardening, Hugg was recently featured on Back To My Garden gardening blog and podcast with Dave Ledoux. Hugg has gardened for nearly 20 years and professionally for 13. She is a certified ornamental horticulturalist and master pruner. Like many newbie gardeners I know, Hugg first became interested in all things garden when she bought her first home. She spent more and more time in the garden to cope with the increasing stress of her day job. "Soon I found myself with no day job, in horticulture school, and working for friends [in their gardens]." The rest is history. Hugg's primary passion is helping people transform their gardening spaces into the garden of their dreams. She says people usually know that they want something beautiful and finished, but figuring out the steps to get to that final goal is where she comes in. Today she talks with us about cultivating gardens in small spaces and offers other seedlings of gardening wisdom. As a first step, Hugg recommends asking yourself what you want to use the space for and letting that guide your decision when it comes to planning out the garden space. Are you the type of person that prefers relaxing outside while reading a book or eating in the garden? 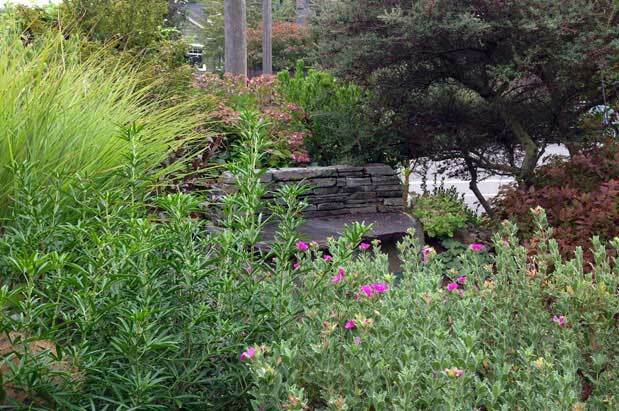 If so, Hugg recommends a simple patio with low maintenance, evergreen shrubs and grasses. What about for someone who just wants a pleasant view from the window and maybe a little privacy? Hugg creates a sanctuary with a mix of trees like Carpinus 'Frans Fontaine' (autumn yellow colored trees that grow in a tight form) and dwarf shrubs like Physocarpus 'Little Devil' (gorgeous maroon foliage and white flowers) and perennials to "block eyesores while giving year-round beauty." If you're longing for an edible, organic garden, consider a series of raised beds with crushed rock in between. "Whatever the goal, remember in a small yard, every square foot counts." When I first started planting flowers or herbs or basically anything, I couldn't keep anything alive. I asked Hugg about some low-maintenance plants that were good when first starting out. Fortunately, she assured me that there are a ton of this type in the Pacific Northwest. "I'm partial to shrubs that have showy flowers or fragrance rather than high maintenace perennials," she says. Some of her other low maintenance favorites include the sweet-scented Viburnum bodnantense or 'Dawn,' which blooms in the winter when nothing else does, the Spiraea 'Magic Carpet' which shows off its yellowish orange and magenta hues while being frequented by butterflies, and the Hosta 'June' plant with its blue outer leaves and buttery centers. She also recommends the Hakonechloa macra 'Aureola' or Golden Japanese Forest Grass which makes a soothing shushing sound in the wind. Hugg shared the importance of knowing whether your plants like shade or sun and to plant accordingly. "Amend your soil with compost to add nutrients and hold in water," she says. Perfect for most Seattleites who are now required to compost anyway. Something new I learned is that there are small, mini-me versions of many plants for those of us with small yards or tight spaces. For example, if you want to grow an apple tree, there's a great skinny form that does well in Seattle called 'Scarlet Sentinel'...or a small Butterfly Bush called 'Blue Chip.' You can research these on your own, ask someone at your nursery or hire a garden designer. Here's a list of graduates for hire from Edmonds Community College's Horticulture Program, in which Hugg is included. With summer gradually bowing out, Hugg warns that the ground is parched and plants have stopped putting on new growth. They need to survive the last of the heat and drought before they go dormant for the fall season. Thus, it's imperative to water your plants this month. Mulch (compost or wood chips) helps to retain water and insulate plants against cold temperatures of winter. "Plants know from the change in sunlight and nighttime temperatures that, as they say in Game of Thrones 'Winter is Coming.'" Their blooms fade and leaves fall — this is just the natural process of plants to instinctively harden themselves off for winter dormancy. In Seattle, September and October are great months to plant since half of your watering work is carried out by the rain. Also, fall is clearance time at plant nurseries so wallet-friendly deals await you. "Nature is simple, noble, silent," Hugg says. "Several studies show that just looking at greenery slows our heart rates and relieves stress. When you walk in a park or in the woods, you feel more at ease, like you can breathe. That's because nature was our first home. When we create a garden, no matter what size, it recreates that natural home, and gives us a sense of reassurance and stability while also offering little surprises and changes. Gardening helps us thrive in modern life."